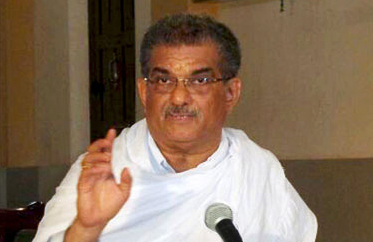 Belthangady, Jan 24, 2017 : Dr. D. Veerendra Heggade, Dharmadhikari of Dharmasthala has said that he would join hands with the people of Tulunadu for the cause of Kambala. "A ban on a tradition will only pave for destruction of culture," Dr Heggade said adding that the tradition of Kambala should be allowed with modifications so that there is no scope for cruelty on animals. "Traditional sports involving animals are practised in almost all nations. Different parts of India too witness variety of bull races," he said. Referring to Kambala, Dr Heggade said no one tortures the buffaloes which are reared with great love and affection. "Kambala has faced the ban probably owing to the neglect of the traditional touch and considering the sport as mere entertainment without paying heed to the custom by a few. This is my personal opinion," said Dr Heggade.
" In case the government and the court finds that torture of animals is involved in Kambala, then let it recommend modifications. Tulunadu people will certainly accept it," said Dr Heggade, once again reiterating that he was with people of Tulunad in their fight for the vacation of the stay on Kambala. The people have the right to take stand to protect their culture an tradition being practiced from quite along time. If Kambala and Jallikatu has to be banned then why no action oin butcher shops?